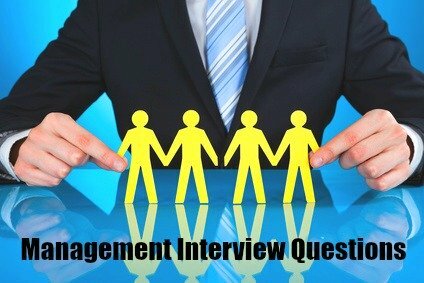 Expect management interview questions that explore your personal management style and the results you get. Use the sample interview answers to these common manager job interview questions to prepare your own convincing responses. With the emphasis on inclusivity and dynamic change in 2019 you can expect management interview questions that explore your ability to handle diverse employees and situations. Be ready for these typical management interview questions that shine the spotlight on the particular style of management you have developed. Which management style have you found to be most effective? Describe how you are able to employ different management styles and interpersonal skills to get the best out of the situation. Give reasons why you use a particular management style in a certain situation and why it works. "I find that it is not effective to use only one type of management style, I have to adapt according to the individual I am dealing with and the situation. For example with inexperienced employees I use a management style that involves a high level of task instruction and close supervision. I find this effective because the employee needs to be secure that they know exactly what to do and how to do it. They also require constant support to build their confidence. For a more experienced employee who is comfortable with the work, I delegate the task and expect them to come to me for help if they need it. This demonstrates my trust in their ability to do the job on their own." Work-force diversity has important implications. Managers need to be able to recognize employee differences and respond to those differences in ways that ensure effective working relationships. ﻿What type of people do you work with most productively? This is basically finding out what type of employees you get on with and what type of employees you find it difficult to work with. This is an important question because it again evaluates the flexibility of your management style. are you able to communicate and interact effectively with a variety of individuals? are you able to establish good working relationships with a diverse group of employees? "I work well with people who are hardworking, competent and confident of their abilities. Obviously I have had to manage people who do not fall into this category. When this happens I set myself the challenge of developing the employee and helping them to use their skills to their fullest potential. My goal is to support them towards competence and confidence through guidance, direction and mentoring." What aspect of your management style would you like to change? No-one is the perfect manager so denying that you have any areas for improvement shows a lack of self-awareness and insight. Focus on an aspect of your management style that you're working to improve. Describe the steps you're taking and give evidence on your progress. "I have been trying not to give my employees all the answers when they ask for help with a problem. They need to learn how to come up with the solutions themselves and I need to guide and facilitate this process. I have read up on how to do this and have put these facilitation skills into practice. For example, I allocate however much time is needed to sit down with the employee and work through the problem. We discuss it, I give my view of the situation and then ask the employee to go away and think about the best solution." The manager's relationship with his or her employees is determined by the management style employed. Be sure to highlight your adaptability and responsiveness when describing your management style. What other questions are asked in a management interview? Know the other management interview questions you can expect. 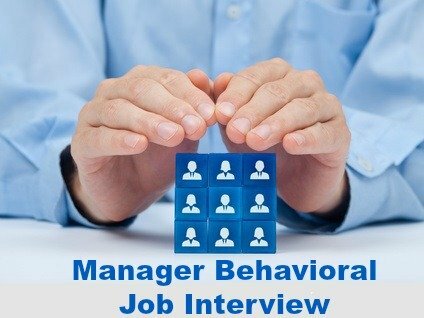 View frequently asked competency-based interview questions at behavioral management interview questions and be well prepared using the excellent interview answer guidelines. Prepare for typical management interview questions that explore your understanding and experience of what being a manager means in today's business environment. this tricky interview question What makes a good manager? 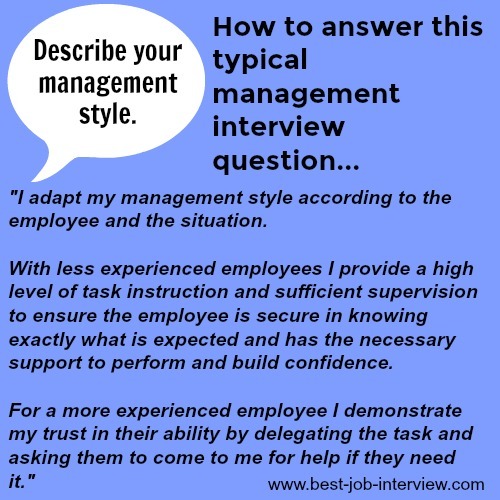 Manager interview questions that explore generic management competencies such as decision-making and delegation skills with interview answer help. Effective managers require strong leadership qualities. Go to leadership interview questions to prepare for interview questions that explore your competency as a leader. View supervisor interview questions to learn about the important qualities required in a supervisory role. What are the key competencies required for successful job performance? Go to 12 core competencies to find out.